Dimensions 0.75 by 6.13 by 9.25 in. 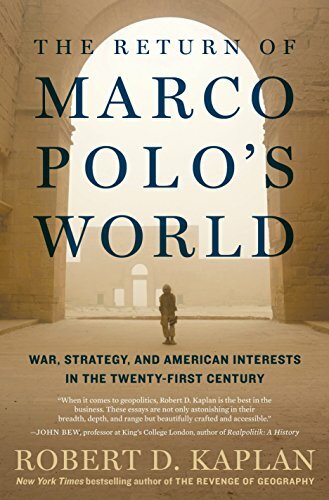 In the late thirteenth century, Marco Polo began a decades-long trek from Venice to China along the trade route between Europe and Asia known as the Silk Roadâa foundation of Kublai Khanâs sprawling empire. Now, in the early twenty-first century, the Chinese regime has proposed a land-and-maritime Silk Road that duplicates exactly the route Marco Polo traveled. Drawing on decades of firsthand experience as a foreign correspondent and military embed forÂ The Atlantic,Â Robert D. Kaplan outlines the timeless principles that should shape Americaâs role in a turbulent world that encompasses the Chinese challenge. From Kaplanâs immediate thoughts on President Trump to a frank examination of what will happen in the event of war with North Korea, these essays are a vigorous reckoning with the difficult choices the United States will face in the years ahead.